This recording was made actually already in 1996. It had to wait entire eight years to be published, though. The repertoire was chosen after consultation with the Vera's former teacher, world-famous virtuoso Raphaël Oleg. 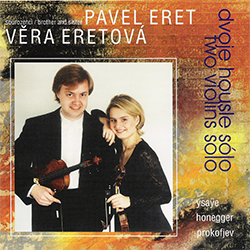 Ysaÿe's Sonata for Two Violins Solo and Honegger's Sonatina for Two Violins are unique at the audio recording market in the European as well as world standard. This CD is on sale. * The fields marked like this are obligatory.